At Sacred Living, my hope has always been to aid people as they struggle with serious illness. Many of my clients are suffering with diseases such as Lyme, MS and Chronic Fatigue Syndrome or they may be dealing with an early or late stage Cancer diagnosis. When people have the opportunity to connect to an animal, miracles can happen. Through my years of work and volunteering, I noticed the positive response people I served had when they were around animals. Because I want to help people in every way possible, I brought my own dog for training to be a Therapy Dog. 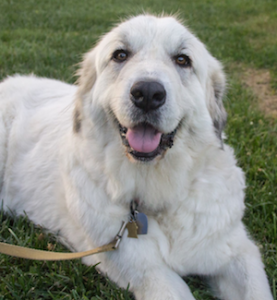 Gracie is a beautiful, sweet Great Pyrenees and she came to us in a rather sad state. She seemed undernourished and had a lead pellet-gun bullet lodged in her side. We discovered it when we asked our veterinarian to investigate a huge ‘wart’ on her shoulder. How could anyone mistreat such an incredibly sweet loving being. She is a love: a total mush. She gently leans right against everyone she meets. When she’s lying down and anyone pets her, she usually turns over and exposes her belly so she can be petted there. I knew she was an angel and would help to heal others’ hearts. 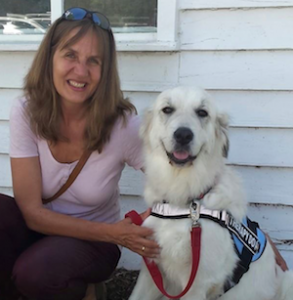 In Spring of 2015, Gracie and I completed training with Therapy Dogs, Inc. and began our journey to spread joy and healing. The very first time Gracie went to the nursing home, we encountered a man pushing an older woman in a wheelchair. She had a grey blanket covering her head, but when she saw Gracie she perked up and pulled the blanket down. She opened her arms and told her son to push her more quickly. Gracie saw her response and started right towards her and when they reached each other, Gracie placed her head right on the woman’s lap. Her son got choked up and leaned over to tell me that his mom hadn’t been this animated in months. She interrupted her son and started telling me about every dog she had ever owned. It was truly a beautiful experience for all four of us. In support of wanting to offer the opportunity to as many people as possible to experience this healing, a portion of all of Sacred Living’s revenue goes to support a new program at our local hospital, Appalachian Regional Healthcare Foundation. They have recently started a program, Pet Assisted Wellness Support Program, which serves four local hospital and outpatient facilities.